Every ZipperAgent user is assigned with a unique ZipperAgent email id. You can also integrate multiple email accounts to your ZipperAgent account. Please refer to “how to integrate email” document for more details on how to integrate email account with ZipperAgent. You can compose and send email messages to one or multiple contacts. You can create templates once and use them multiple times while composing email. Please refer to “how to create email template” document for the same. You can also customize your signature and append it automatically while composing an email message. Please refer to “how to add email signature” document for the same. You can select one/multiple Contact(s) and click on the Email button on the header. The email composer dialog opens with the recipients (if email id is clicked or email id is available for the selected record) populated. While on the detail page of a record, click on the “More” button to expand and see all associated connections and communications of this record. On the right tabs, click on Email to see a list of email communication with this particular record. You can also send a new email by clicking on the Compose button. You can also navigate to Emails module from Menu -> Activities -> Emails and click on “Compose” to compose an email. While sending email from ZipperAgent, you can choose “From” email id, if you have integrated external email accounts to ZipperAgent. The message will be sent from your own email account and will appear in Sent folder of your email provider. In absence of any external integrated email account, all your emails will be sent from default ZipperAgent email id (which can be found at the bottom of the Email module). ZipperAgent remembers your last chosen “From” account and it will preselect the last used “From” email for all subsequent emails sent, unless it is changed by the user. All emails sent from ZipperAgent will be automatically linked to Contacts/Opportunities inside ZipperAgent. These linked emails will be shown in the related (Email tab on expanded record details page) email list of the record. You can see all your integrated email accounts and ZipperAgent local folder under one roof here. Go to Menu -> Activities -> Emails. The first tab, named “Local”, will always be available as this is the default email account for every ZipperAgent users. Once you integrate one or more email accounts with ZipperAgent, those will also appear besides the Local tab. All emails sent out from ZipperAgent will appear under the Sent folder of Local tab. All emails which were not sent due to network or other issues will be put under Outbox. All emails which are shared with you will appear under Shared folder. Download emails from your external email accounts into ZipperAgent to avail Linking, sharing and tagging facilities provided by ZipperAgent. Click on the blue small icon just before the “From” email in Inbox list to download and auto-link emails with existing ZipperAgent contacts. Once the email is downloaded, the color of the download icon will changed to orange. Any email sent from ZipperAgent will be automatically linked to Contacts/Opportunities/Properties in ZipperAgent. When you receive an email in your ZipperAgent default user mailbox, the system scans the header of the email addresses and automatically links the email to matching records in the system. If ZipperAgent does not find a matching Contact in the system with the email id, then it creates one and links the email. The linking algorithm reads 'From’, ‘To', 'CC' and 'BCC' addresses. Linked email will be shown in the related Email list of the corresponding record. You can also manually link an email to any Contact/Opportunity/Property in ZipperAgent. While you are in the email view page, click on the small icon dropdown at the beginning of the Link Email text box and select the Link Type. Then click on the small lookup icon to open a lookup and choose items of the selected type. While in email view page, you will be able to see the linked objects to this email on the right sidebar. You can unlink an email by clicking on the 'X' button of linked item. 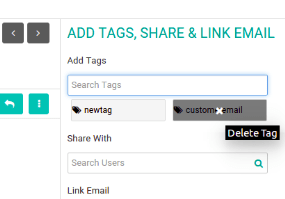 You can tag an email and remove the tag from an email. Start writing name of an existing tag or a new tag name in the text box below Add Tag. 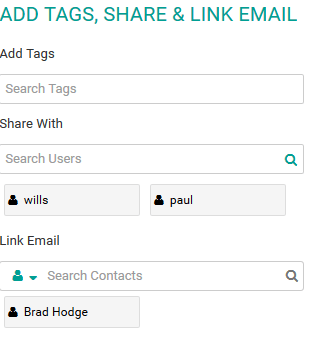 If it is an existing tag, it will get added to the email otherwise a new tag will get created and added to this email automatically. 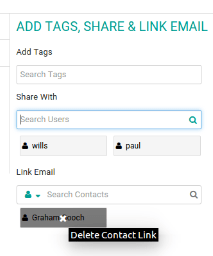 You can remove an existing tag from an email by clicking on the 'X' button appears while you hover the mouse pointer over the tag name. You can share an email with any other ZipperAgent user. 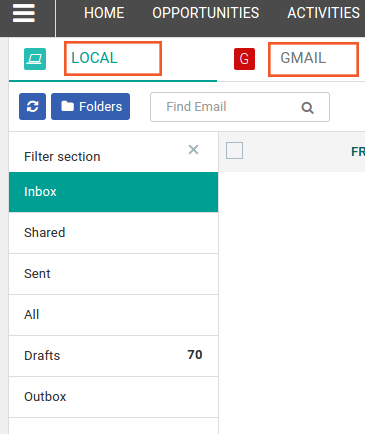 The shared user will be able to see such shared emails in his/her Shared folder of Local mailbox. 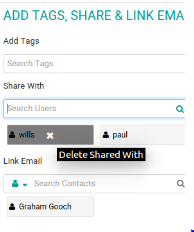 You can also remove sharing of an email by clicking on the 'X' button while you hover the mouse pointer over the shared user name.